James Schlesinger, Who Held Cabinet Posts And Led CIA For 17 Weeks, Dies : The Two-Way Beginning with Nixon, he served three presidents in Cabinet-level positions and was regarded as a "hawkish and erudite" thinker on economics and national security. Schlesinger was 85. 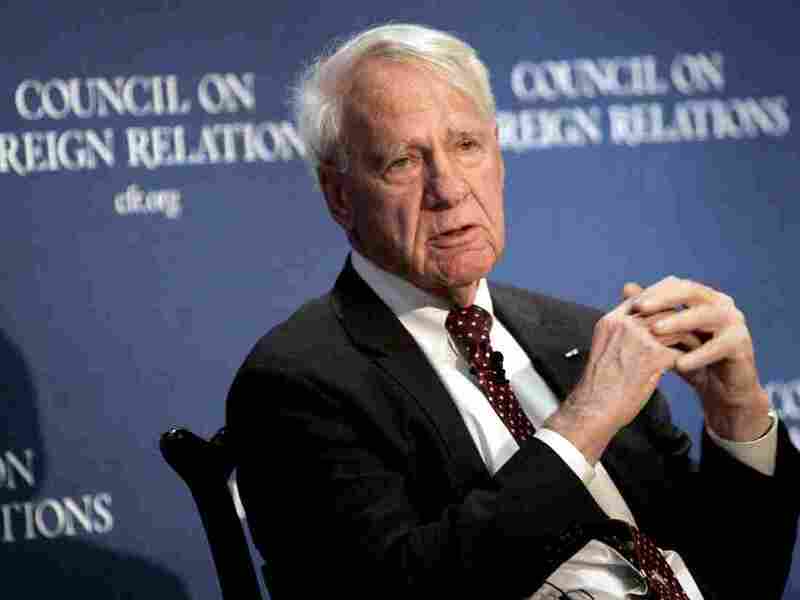 Former Secretary of Defense James Schlesinger speaks at the Council on Foreign Relations in New York in December, 2006. James R. Schlesinger, who served three presidents from both parties in top Cabinet-level posts, has died at the age of 85. The Washington Post says he died Thursday at a hospital in Baltimore of complications from pneumonia. Schlesinger, a Republican economist described by The Associated Press as "hawkish and erudite," first joined the Nixon administration as an assistant director of the Bureau of the Budget. Two years later he became chairman of the Atomic Energy Commission and then Central Intelligence Agency director before being appointed to head the Department of Defense. He stayed on after Nixon's resignation, serving President Gerard Ford in the DOD post. He was later appointed by President Jimmy Carter as Secretary of Energy, the first to hold the then newly created Cabinet post. The Center for Strategic and International Studies, where Schlesinger was a trustee, confirmed his death Thursday. "He left an astounding mark on American security and energy policy," CSIS said on its website. "After leaving government, Dr. Schlesinger continued to promote a stronger and more prosperous country through his work at many policy institutions, including CSIS. We greatly mourn his passing." "Mr. Schlesinger specialized in the economics of national security, which helped propel his rise during the Cold War from academia to influential jobs in the federal government, including CIA director, secretary of defense and the nation's first secretary of energy. "He gained a reputation as someone willing to cut jobs and implement unpopular policies with little regard for what other people thought of him. In 1969, Mr. Schlesinger joined the Nixon White House staff as deputy director of the Bureau of the Budget, where he overcame Pentagon opposition to cut $6 billion from the defense budget during the Vietnam War. Impressed, Nixon named him chairman of the Atomic Energy Commission, which ran the nuclear weapons complex and regulated the nuclear power industry." "A few years earlier, Ellsberg, a onetime defense analyst, had leaked to the New York Times a secret Pentagon history of the events leading to the Vietnam War. "Mr. Schlesinger was furious. He considered the break-in a violation of the CIA charter, which prohibits the agency from acting as a domestic secret police. He sent a memo to the CIA staff asking for information about any illegal activities the CIA had conducted since 1959. The responses revealed a history of illegal spying against Americans, including antiwar protesters and journalists. The CIA would uncover nearly 700 violations of its charter." The AP says that former Sen. Sam Nunn, (D-Ga.), who sparred with him as chairman of the Senate Armed Services Committee described him "a remarkable public servant."